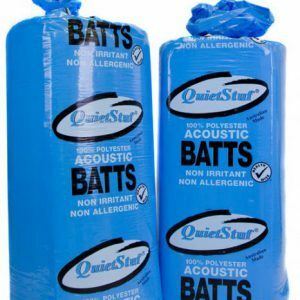 Blue Acoustic Quiestuf sound insulation batts are designed for targeting noise reduction for standard timber walls and steel-framed residential and commercial buildings. Also working as thermal insulation, quiestuf concentrated on reducing airborne sounds, impact noise and noise transmission by controlling resonating noise in the construction cavity. Questuf Batts come pre-cut to fit standard wall framing and mid-floor joist spacings.